This kit is appropriate for grades Pre-K+. Reveal the magic of metamorphosis with Insect Lore's fascinating Ladybug Land™. By popular demand, you can now pay for your larvae and habitat all at once via our Habitat with Prepaid Larvae option or order the version you’ve always ordered and pay for your habitat now and your larvae later via the Standard Habitat. 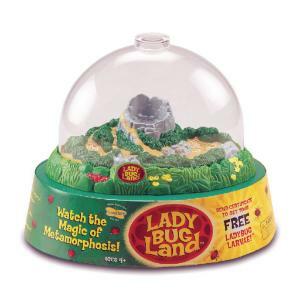 Both habitats include the same colorful domed Ladybug Land observation habitat, a magnifying lid for close up observation, a pipette to feed the ladybugs, and a voucher for 15-20 live ladybug larvae that Insect Lore will mail directly to your address. Additional fees apply if you order the Standard Ladybug Land habitat. You get to watch tiny larvae bloom into adorable ladybugs - catch them in action as they eat and molt. The spots on a ladybug's back don't really tell its age! That is an old myth. The spots actually identify the species of ladybug it is. Ladybug shells are red, yellow, or orange and their spots are black, red, white, or yellow. Some Ladybugs have no spots, but for those that do, the least number of spots is two. Accessories information: See accessories tab for additional ladybug products including ladybug refills for your habitat. Ordering information: Both versions of this habitat come with a voucher for larvae that is fulfilled through a third party. One habitat comes with a voucher that requires an additional charge to receive larvae. One habitat comes with a PREPAID voucher. Live ladybug larvae are shipped to destinations within the Continental USA and Alaska. The supplier cannot ship live larvae to Hawaii, Puerto Rico, Mexico or Canada.